India’s composite PMI rose from 51.5 in September to 52.6 in October, indicating stronger growth in private sector activity across the country and the joint-fastest pace of growth since March 2015. Per Markit: “The latest improvement was driven by services, as goods producers saw growth of production wane.” 3mo average though October 2015 stood at 52.2, signalling faster growth in the 3mo average through July (50;9) and an increase in there ate of growth compared to 3mo period through October 2014 (51.2). This marks fourth consecutive month of above 50 reading for India and also a fourth consecutive month of India leading BRIC group in growth terms. China Composite PMI signalled some early signs of stabilisation of Chinese business activity in October, posting reading of 49.9, up from September’s 80-month low of 48.0. Nonetheless, the index reading in October was the third lowest since May 2014. On a 3mo average basis, 3mo reading through October 2015 was at poor 48.9, down on 50.9 for the 3mo period through July 2015 and down on 51.9 3mo average through October 2014. October marked a third month in a row of negative growth across the Chinese economy, although relative position of Chinese economy in BRIC rankings did improve from being second worst in July-September to third worst in October. last November. However, growth was insufficient to prevent the composite index slipping to a seven month low of 49.0 (from 50.9 in September).” Thus, in October, Russia moved to the position of second weakest growth in the BRIC group. Brazil’s Composite PMI remained unchanged at 42.7 in October, staying below 50.0 reading threshold for the eighth month running, “highlighting the longest sequence of continuous decline in Brazilian private sector output since the global financial crisis. 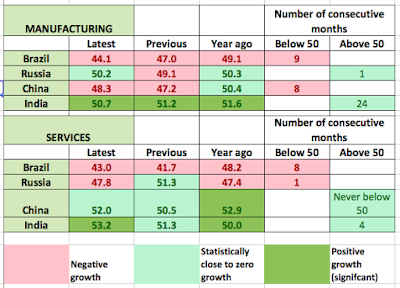 Sharp rates of contraction were noted in both the manufacturing and service sectors. …the latest reduction in employee headcounts was the most pronounced since composite data were first available (March 2007).” 3mo average through October stood at abysmally poor 43.4, which is marginally worse than 43.5 3mo average through July 2015 and significantly below the recessionary reading of 49.5 recorded over the 3 months through October 2014. 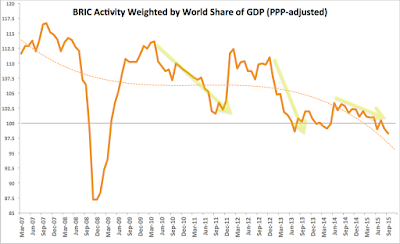 As chart above indicates, overall Composite Activity Index for BRIC economies as a whole continued to take water with both trend and current reading well below 100.0 marker of zero growth. 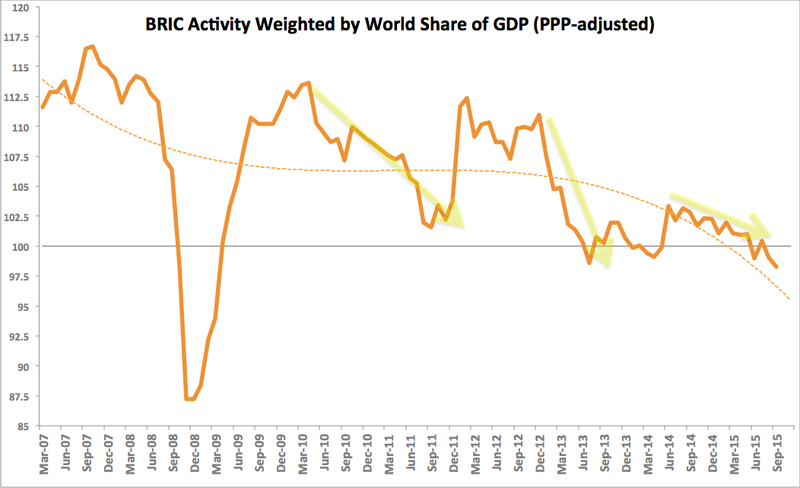 Brazil continues to lead BRIC group into recessionary territory in terms of aggregate growth, with Russia now ranked as second lowest growth momentum economy. On a simple average basis, BRIC Services PMI came in at around 49.0 with Manufacturing coming at 48.3, suggesting that overall growth conditions remain weak across the world’s leading EMs.